R-SYS will be present at the number one exhibition in the world of air traffic – WATM Madrid. R-SYS, Ltd. together with its mother company ERA will exhibit its proven technologies for aircraft surveillance and air traffic management and their most recent innovations at the World ATM Congress. This international exhibition and conference organized by CANSO (the Civil Air Navigation Services Organisation) will take place at IFEMA trade park in Madrid, Spain from March 6th to 8th, 2018 with a record-breaking number of 232 exhibitors from 33 countries. 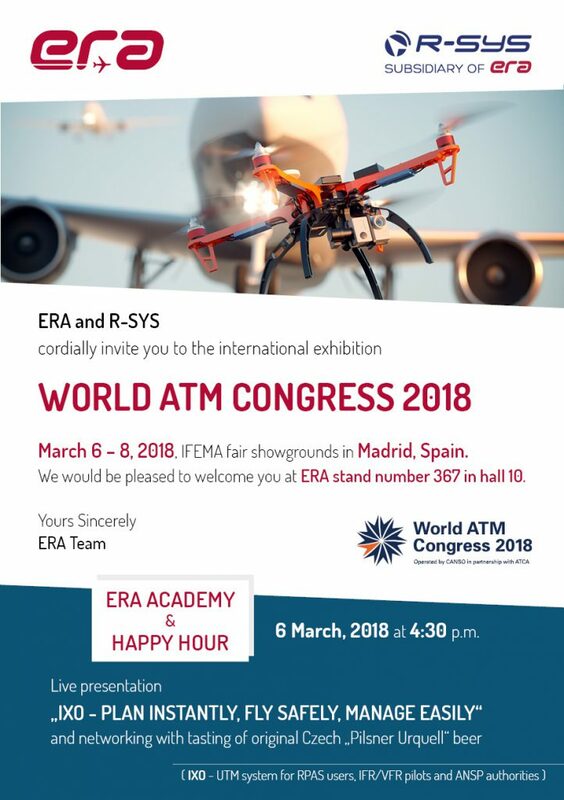 We cordially invite you to visit us at ERA stand 367, learn about IXO SYSTEM – a novel ATM solution, and enjoy our Happy Hour on March 6th at 4:30pm.